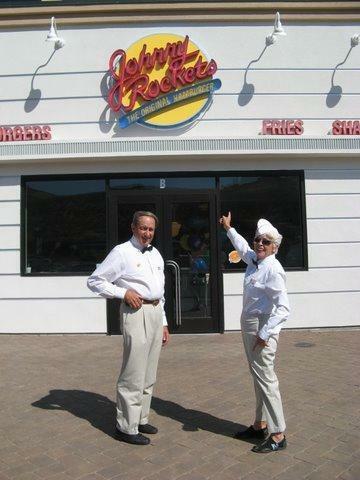 Come celebrate the Grand Opening of Gene & Shirley Burger’s JOHNNY ROCKETS this Saturday, September 26th 2009 from 10:30am to 11:30pm @ Carson Lanes Retail Center on US 395 South & Snyder Ave.
Carson Lanes Remodel is going well and should be completed by the end of the year. MBI construction will now focus their attention on the completion of the other Carson Lanes businesses and operations, Wally’s Pizza & Subs, Genoa Candy and Coffee, Kernels Popcorn, Classic Billiards and Arcade Rooms. All of these businesses will be opening over the next few months. The bar & lounge will soon undergo renovations to include more seating, a new dance floor, new HD Flat Panel televisions and will also open with a new name, The 11th Frame. Local businesses and groups are already booking space at The 11th Frame for Football Season and other events, including the Raiders Booster Club. The Bowling Alley will feature a new Daycare Facility, Pro Shop, remodeled Coffee Shop, along with beautiful new carpet throughout the center. The Burger family is dedicated and excited to provide new, family entertainment and quality dining choices for the entire Carson City community and surrounding areas. Visit www.carsonlanes.com for more info.